If you are building a new home, you are probably asking, “what can I expect to pay for a new Residential HVAC system?” HVAC systems vary in price quite a bit. This HVAC guide discusses cost factors and will provide an approximate idea of what you’ll spend on a new HVAC system. Capacity/Size: Furnaces, heat pumps and air conditioners are made in various sizes to meet the heating and cooling needs of the home. The more heating and cooling the unit can produce, the more it will cost. Quality: Most manufacturers make HVAC components at different quality levels in order to meet the needs of a wide customer base. For example, American Standard makes a Platinum Series, Gold Series and Silver Series in descending order of quality. The higher the quality, the more the new HVAC system will cost. Features: Some furnaces, heat pumps and air conditioners have added features designed to produce a more comfortable indoor climate. Furnaces are made with 2-stage or modulating gas valves that produce balanced, gentle heating. A variable-speed blower on a furnace or air handler will run more quietly and help eliminate hot or cold spots in the home. Heat pumps and air conditioners might have a 2-stage or modulating compressor that also influences home comfort. Dave Lennox makes air conditioners and heat pumps that can accept solar panels that produce energy to run the HVAC system. Upgrades like that are expensive. The more features the HVAC system has, the more it will cost. Efficiency: The more efficient use the HVAC system makes of energy, the more it will cost. A 97% efficient furnace might cost 30% more than a comparable 80% furnace; a 20 SEER heat pump might cost 50% more than a 13 SEER heat pump. Keep in mind, however, the higher the efficiency is, the lower your utility bills will be. If you live in a climate where that particular component will be heavily used, more efficient models will be more economical in the long-run. Split system with a gas or oil furnace and a central air conditioner. Split system with a heat pump and an air handler. Split system with a heat pump and a gas furnace (typically in colder climates). Package system with a gas furnace and an air conditioner. Package system with a heat pump and an air handler. Package system with a heat pump and a gas furnace (colder climates). In addition, split systems require an indoor coil that is installed in or above the furnace or air handler. Coils cost between $500 and $700. Installation costs depend on the amount of time and materials used in the job, the cost of living in your area, competition among local dealers, and the time of year. In most cases, it accounts for 35% to 50% of the total cost. You’ll get lower estimates if you can avoid having the work done when HVAC contractors are very busy, usually mid-winter and mid-summer, depending on your climate. With these factors in mind, installation of a new residential HVAC system in a new home will cost between $3,000 and $5,000. Combining possible equipment costs with installation costs, your new HVAC system, installed, will cost $5,200 to $11,000. 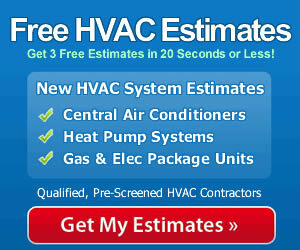 These HVAC prices reflect what you can expect to pay for a new HVAC system installed. You can keep your costs as low as possible by choosing HVAC systems with fewer “bells and whistles” such as 2-stage heating or a variable-speed blower. If you can choose the time of year, have the work done when HVAC companies are slow and willing to offer discounts on installation. And always be sure to get multiple written estimates for the work. Choose a qualified contractor to install the equipment – one with fair prices and a proven track record of quality work. When it is installed properly, your new HVAC system will provide the performance, efficiency and durability it is capable of.